By Joshua Molina, Noozhawk Staff Writer | @JECMolina | October 11, 2018 | 9:42 p.m.
Don't call it a snow cone. It's far from ice and flavored syrup. 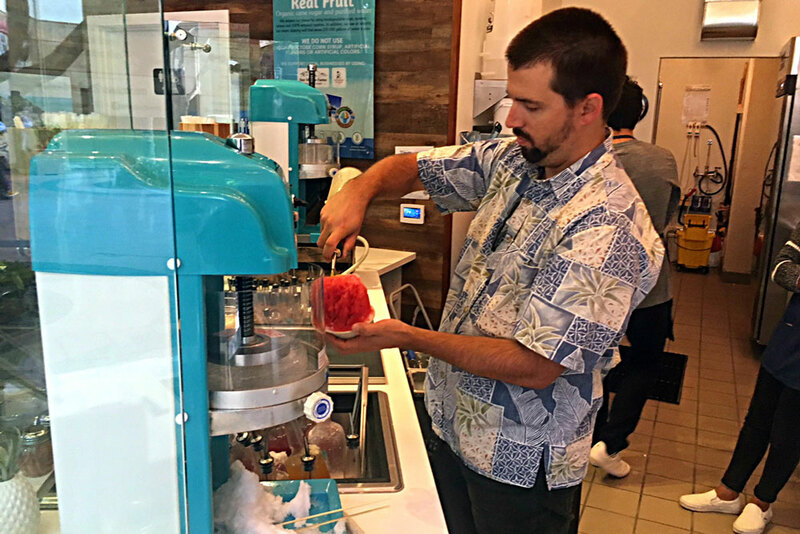 Lee Jacobs and business partner Marek Nold have opened ParadICE Shave Ice at 11 W. De La Guerra Plaza at Paseo Nuevo Mall, across from the theater. They use real fruit juice and cane sugar to flavor their shaved-ice treats. The shaved ice can be served on top of vanilla ice cream, for a super sweet treat. "It's my favorite dessert," said Lee's wife, Chelsea Jacobs, who manages the shop. "It's delicious." She had been prodding her husband to open a shave-ice store for years, but it wasn't until they went to Hawaii and he tried it there that he became a believer. "I took one bite. It was awesome," said Lee Jacobs. The flavors include mango, passion fruit, blood orange, strawberry, guava, pineapple, raspberry, cherry, lychee, banana, pomegranate and coconut. They also use all organic, compostable products, including biodegradable cups, spoons, straws and 100-percent recycled napkins. They decided that it was unique for Santa Barbara and opened the store in September. It's part of a Paseo Nuevo renaissance, nestled next to another recently opened shop, Bubble Pop. Already they have had a lot of return customers. "Once they get in here, they get hooked," Chelsea said.